Team Who What Wear UK sifts through a lot of brands, products, and collaborations every week, but the world of retail is far too large for us to cover every millimetre of ground. That's why it's always important to check in with other industry people on a regular basis (and not just stalk Instagram for #ad content). They may have been on a shoot and spotted an indie jewellery brand that hasn't even hit the market or have caught wind of an upcoming capsule collection they've scooped an exclusive on. It may even be that they're in an office full of voracious shoppers (yes, it sounds like ours) and that all current purchases share something in common (right now for Team WWW UK, it's hair clips and anything from The Frankie Shop). From online styling gurus to fashion editors from some of the UK's biggest and most revered publications, I asked some of the industry's best dressed ladies to kindly share their spring shopping lists. What's on their radar? Keep reading to find out and purchase these power pieces for yourself. Follow Florrie on Instagram @florriet. "Dresses are my favourite thing to wear, so I always think they're worth investing in. This time of year, I love buying ones I can wear now with boots, etc., and then team with sandals come summer. This dress makes me so happy—you can't not feel great in yellow—but it will also look so chic mixed with all my favourite shades of brown and tan." "I love baskets for summer, but there's something refreshing about this mini tote as a kind of alternative from all the wicker and raffia. It'll work with everything, and there's something about brown gingham that feels chic yet playful." "Timeless Pearly is one of my favourite jewellery brands right now. Visiting Leslie—the amazing designer behind the brand—in her Paris showroom during fashion month was literally my equivalent of visiting the best sweet shop ever! I kind of want everything, as it looks best worn layered up, but I particularly love beaded necklaces for the summer, and this pearl one is simple but beautiful." 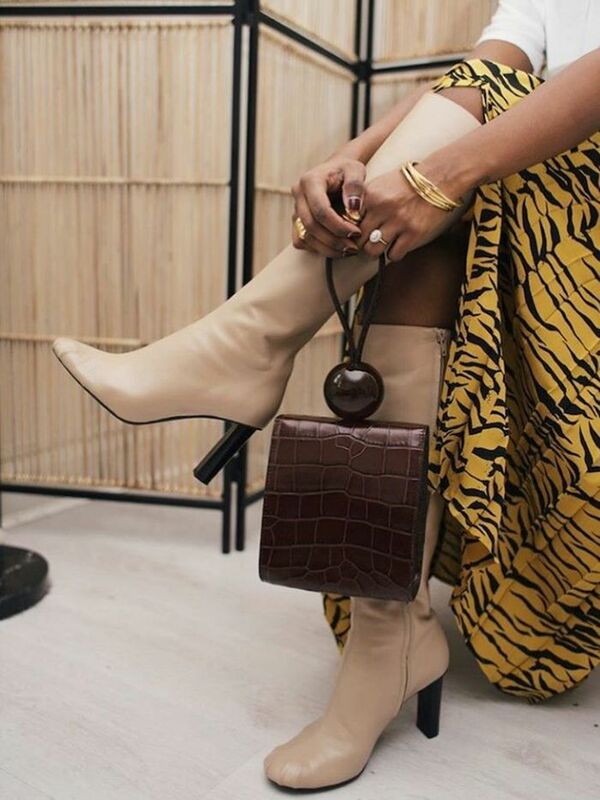 "I couldn't be more excited that Staud has just launched shoes (to add to ready-to-wear and bags), and they're even more brilliant than I could have hoped for! I've been looking for wedges that aren't too high for trotting around in all day, and these are just the ticket. I'll wear them with the yellow Rejina Pyo dress come spring." "I've been looking for the perfect gold chunky bracelet for such a long time. I've searched for vintage ones but never found anything that's quite right, so I was so excited to find this one in The Frankie Shop by Laura Lombardi. It's become an everyday classic for me." Follow Arabella on Instagram at @arabellagreenhill. "Like an elevated, infinitely more wearable update on the basket-bag trend, this tan raffia style from Parisian brand Elleme will be my go-to summer bag for work and holiday." "I have this thing with trenches. Seriously, I own a lot, but I also wear them a lot, so having a collection is a more sensible idea than it sounds. I love this spin on a classic idea, and I now feel it's a total must to add to my catalogue. I'm ready for you, April showers." "My addiction to summer sandals might outweigh my trench problem. I love everything by The Row except the price tags, but I'd wear these every single day to make it worth the investment. These are surely the chicest 'dad' sandals around." "Cargo pants, but not as you know them. A more refined style (still with the all-important pockets and I love the camel stitching) that can be worn in a more grown-up way with heels and a fitted top." "Sightly obsessed with leather shirts at the moment. I'd wear this layered over a polo-neck right now, but on its own or open as a jacket over a dress when it gets warmer." "Talking of dresses, a dress and sandals is my summer uniform. & Other Stories always does a great dress, and there are so many options to choose from right now. This has just the right amount of detail and colour to be enticing, but it's not so OTT you feel like you can't wear it on repeat." Follow Nana on Instagram @styledbynana. "I'm a big fan of tailoring, and many high-street brands have done it extremely well this season. The cut of this blazer and matching trousers is super flattering." "I don't wear jeans so trousers, especially with a belt, are my thing. This suit will look equally as good worn together or as separates." "Okay, so the mini-bag trend is highly impractical, but I'm still here for it. This classic tortoiseshell finish will go with pretty much anything in my wardrobe. Granted, I'll only be able to fit my house keys and a lipgloss if I'm lucky, but the point is I'll still look super chic… hopefully." "I live in colour, but I live for summer dressing even more! This dress has both things covered. I'd wear with flat leather sandals or cute mules. It's the ideal dress for any of my summer holidays or weekend picnics in the park. Praying for a repeat of last year's weather." "I've not really been on board with the vinyl trend, but these wedges have stopped me in my tracks (it's the added gems I absolutely love). They'll be the perfect statement shoes for many of my nights out." Follow Flora on Instagram @floramjohnston. "I have a horrible habit of buying a new pair of sunglasses with the changing seasons. Next up for spring are these framed aviators from Acne Studios. They're simple, chic, bold, and in my eyes, perfection." "All I know is that this swimsuit peeping out from under a crisp white shirt or worn with a wrap silk-tie skirt is most definitely a vibe. I make no excuse. I want it." "I always find flats a tricky conundrum, as I categorize myself as a boots-and-heels kind of gal, however, these cowhide square-toed numbers from Mango are wonderful, and would work with any sartorial mood and wardrobe." "Summer is fast approaching, and I have one thing on my mind: jewellery. What will go with multiple outfits and translate from beachside restaurant to boardroom meeting? I currently have my eye on these gold hoops from Valentino. The chunky gold bar, stud and upside-down horseshoe shape gives them an edge whilst still being wearable." "I cannot help myself: I love a good blazer, and I love tartan. A lot. This oversized delight from Tibi would go well with jeans in autumn or over a simple silk slip-dress in the warmer months." Follow Ebony on Instagram @_ebonylouise_. "I already have the Puzzle bag in black and use it most days. I was toying with buying it in another colour, but then I saw this other shape and I was sold. The leather, craftsmanship and chic silhouettes have me looking to Loewe every season. Plus I've been wearing more shades of brown recently, and the texture is so good against the leather trims. Add to basket immediately!" "I love a good maxi (I rarely show my legs! ), but I also love the sun on my shoulders, so this will be a perfect daytime throw-on during the warmer month. I also enjoy a tonal outfit, so I'll be pairing this with my trusty Alexander Wang Amelia studded flats, gold hoop earrings, 'old' Celine sunnies and a basket I got from a trip to Barcelona last year." "A classic investment but in dark military khaki that will suit my skin tone even better. I'll throw this on with everything—denim and tees, simple slip dresses, belted with some strappy heels for evening. I won't be taking this off!" "I recently donated a ton of older jeans to charity, so I'm ready to invest in a new staple pair from Totême that are non-stretch and have that vintage vibe. I live in denim and trousers, and am very loyal once I find a good fit, so if these work out, I'll be purchasing all the other washes! The brand's new store looks gorgeous, so maybe I need to make a trip to Stockholm; then I can try on the shoes too—a perfect pairing with the denim." "I have a few occasions coming up this spring, and this is the perfect dress for me. A neutral print, the dramatic sleeves, the long length and the flattering silk fabric is what drew me in!"